As promised from yesterday’s blog, I plan to give you more insight into my history with the illustrious (at least for me) zucchini. For all who know me personally, I have a pretty healthy sense of humor. Hence, no one in my family was surprised when while perusing for zucchini recipes I let out a serious belly laugh that resulted in tears flowing down my cheeks. What tickled my fancy so much you might ask. While searching for a zucchini saute, I noticed a little link on the side of the page. When I opened it up (which I encourage you to do so – right now), I guffawed even more. http://allrecipes.com/howto/sneak-some-zucchini-onto-your-neighbors-porch-night/detail.aspx?msg=2#comments I love “invented” holidays – like “Watch the Last Sunset of the Year” which is a Team Stevens family tradition; thus “Sneak Some Zucchini onto Your Neighbors’ Porch Night” was right up my alley. It was part good-natured fun, part It’s the Great Pumpkin, Charlie Brown with a little mischief thrown in the mix. What really spoke to me about this holiday was the notion I was way ahead of my time as a college friend and I were trailblazers in this movement. While reading the article, I was transported back to a night in the fall of my senior year of college. Both of our dads taught at the college we attended; so we made the frugal choice to live at home and save our money. Late one night while studying for Physical Chemistry in my friend’s basement, we heard a small voice coming from the top of the stairs. “Girls, could you please come up here for a moment?” Considering the time was already approaching 11 pm, we did not delay in our ascent upstairs. Upon our arrival in the family kitchen, we discovered bags cluttering the counter. Yes! Bags of club sized zucchinis! “Girls, when you are done with your studies I would like you to kindly walk around the neighborhood and deposit these bags on the neighbors doorsteps.” My mind was racing – “Did I hear her correctly?” and “Is this even legal?” were the most prevalent thoughts floating around. Growing up in the South, I hadn’t quite embraced the Midwestern flair for neighborly love and sharing, because I know some neighborhoods where that type of generosity would be more than frowned upon, particularly at that hour of the night. However being sweet college chemistry majors, we obliged the matronly request as if Mother Earth had whispered to us a siren call of sharing her bounty from the family’s garden. In the chilly North Dakota darkness of a fall night, we ran with bags overflowing up and down a certain 1st street in a small town bequeathing beautiful, bountiful squash. Vividly, I remember the adrenaline rush of our commando mission in the crisp air and the reverberations of our giggles throughout the neighborhood. I know not everyone will embrace this holiday as much as I think I just might. It has the potential to become an annual summer festival around my house. (Just to clarify, however, I do not plan to employ all the suggestions for revelry including, but not limited to, running naked or wielding a machete.) Personally, I think this would be a much better countdown than the number of days until back to school. So here’s to 15 more days until . 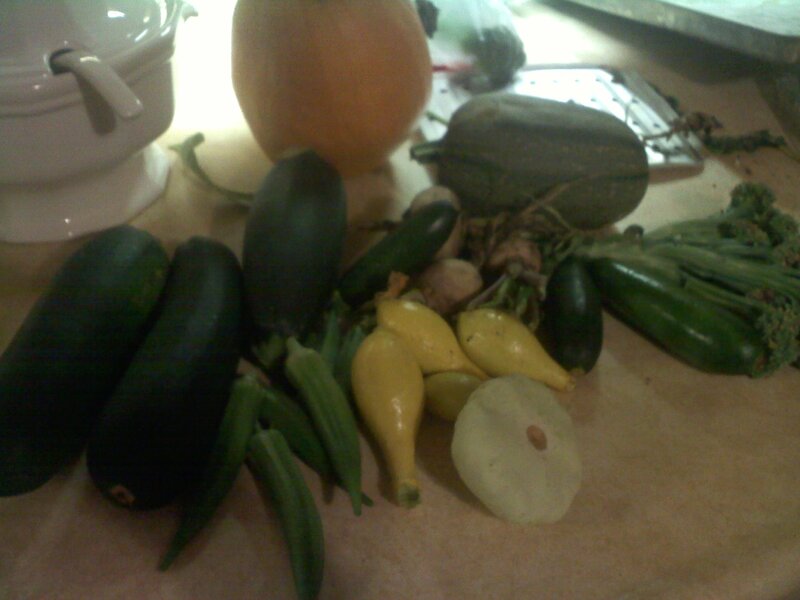 . . the Zucchini Faerie strikes again! I wish the Zucchini Faerie could fly past our neighborhood and drop off some Zucchini! Your post reminds me of when we took our oldest for college orientation. The woman who spoke at the class for parents had recently moved to Minnesota and her friends told her to be sure to keep the doors to her car locked in August. She had no idea why until one day after work she returned to her car to find it filled with giant zucchini. OH, and by the way. It’s o.k. to run naked through the zucchini patch or to wield a machete but for pity’s sake don’t do both at the same time! That could get ugly!